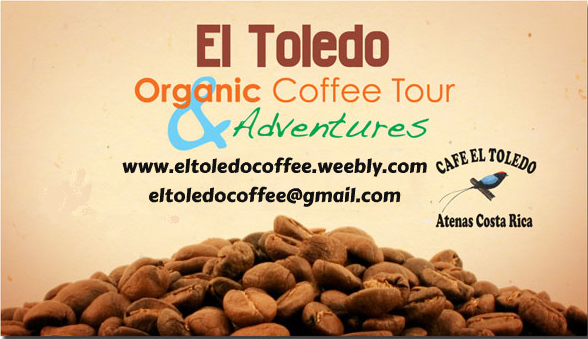 Many of our vacation rental guests at Villa Doughty have spent an afternoon at the small El Toledo Organic Coffee Farm in Atenas. Most of our guests say it is a must see attraction if you are staying in Atenas. The coffee tour, given by the owner’s son, Gabriel Calderon Vargas, “is real, unaffected, un-commercial, informative, and inspirational and gives you a great perspective on what organic farming is all about”. For those who want to learn about organic farming this is a phenomenal tour. Depending on what time your tour is you will always enjoy samples of their three coffee beans and you may also enjoy a lunch. Check their calendar for availability on dates and times. $20 per person for the 2 1/2 hour coffee tour. Be sure to wear comfortable shoes! ← Want to Save Money on Your Next Vacation Rental? – News – How To Avoid Paying Those Listing Site Service Fee!